The Moon will be in Aries for the next 2 days. She will be opposing her ruler, Mars in Libra and conjunct Uranus by Saturday night. No matter how much independence we are looking for we still have to work together. Collaborating could prove difficult because of some unforseen element. Or it could be that we are awaken to a deeper truth in regards to our partnerships. Any way you slice it, the weekend is full of momentum. Handle others with care and favor patience over reactivity. Cathy Tickle hangs securely from the bin to husband John. 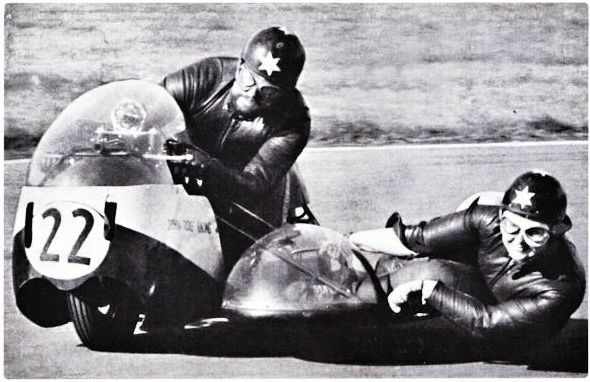 They appeared mid 60s in the continental circus on a Norton Manx. Previous Article Thank Goddess it’s Venus Day!